President Barack Obama brought his vision for Virginia’s middle class to Green Run High School in Virginia Beach earlier today. It was the first of stops, with my old high school, Phoebus, in Hampton being the second. A third stop was planned for Roanoke. Some 1,400 people crowded the gym, with another 700 in an overflow room, according to the fire marshal. 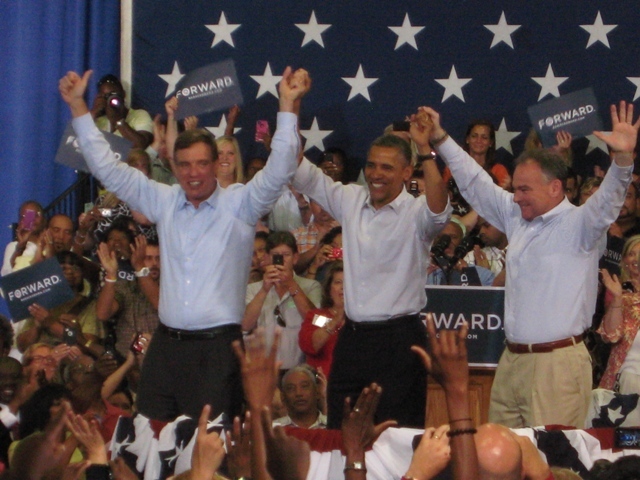 Accompanying the president was Senator Mark Warner, who delighted in introducing Senate candidate Tim Kaine as the next junior Senator from Virginia. I have videos of all three speeches and will post them once I get a chance to. But before the event started, I was introduced by Chesapeake Del. Lionell Spruill, Sr. to New York Congresswoman Carolyn Maloney. Maloney grew up in Virginia Beach, graduated from high school here, and still has family in the area. Her sister managed to get tickets to the event. Spotting her in the crowd, Spruill brought her into the reserved area, which happened to be just in front of the press area. I asked Rep. Maloney, who represents NY’s 14th Congressional District, to share her thoughts, and she was gracious enough to do so. After the president’s speech, I sought out conservative radio show host (and former Daily Press editorial page editor) John Fredericks, who was sitting the press section, although I saw him standing the entire time the president was speaking. Having been on John’s show a number of times, I was curious as to his take on the speech. just watched the Fredricks video….you amaze me, ol’ fearless one! I still need to talk with you when I get home. I retire from the Army next week and will then focus on getting busy in the community. I will call you. Fearless? Naw 🙂 Let’s catch up soon. good statements by Fredericks. Big issue is why to hire Romney. For me, Obama’s lack of leadership has been an issue. He could have taken advantage of his political position, modified the Bush tax cut extenstion between November 2010 and January 2011, as an example, but didn’t. But the Republicans, again, have nominated a weak candidate, one even their base questions. So, why hire him? He could have taken advantage of his political position, modified the Bush tax cut extenstion between November 2010 and January 2011, as an example, but didn’t. Incidentally, that maneuvering on the Bush tax cuts is happening right now. After Rep. Cantor crashed Speaker Boehner’s original deal with President Obama on the debt ceiling and forced everyone back to the table to eventually accept the creation of the Joint Select Committee on Deficit Reduction, one of the stipulations everyone accepted was automatic sequestration of government spending in the event that the committee failed to produce a plan for further deficit reduction. The terms of the sequestration push 50% of those automatic cuts onto the Department of Defense, and it’s scheduled to take effect the same day as the expiration of the Bush tax cuts. Our plan right now is to give Republicans a choice: they can have a lot of that defense spending back, in fact we WANT to give them that spending back because it creates jobs civilian jobs in defense contracting and administration: but first they have to concede that we’re going to let the Bush tax cuts expire for the top tax brackets. Republicans may choose to accept this deal relatively quickly, or they may choose to keep it around as a campaign issue. I hope they’re foolish enough to try the latter approach; Virginia is one of the largest benefactors from DOD spending in the nation, and if GOP members put themselves in the position to explain why tax breaks for millionaires are more important than national security, that’s going to compel a lot of government contractors and employees in Northern Virginia to come out on election day and help us hit our vote goal.